At least when it’s not honesty, integrity, creativity…or…. Drop your five in the comment box! I’d love to know what you think. 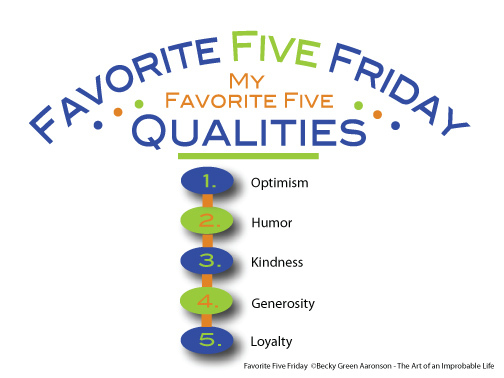 This entry was posted in Favorite Five Friday, Writing and tagged favorite five friday, Friday, qualities by Becky Green Aaronson. Bookmark the permalink. Great list, Deborah! Patience is a quality I admire tremendously, and often which I had more of. Thanks for dropping you five on us! I like your 5. I will trade your kindness, though, for empathy. I will leave the rest the same. I’ll take your empathy, and raise you compassion. Hi Becky, I know you wrote that list about others — but I believe those 5 qualities apply to you as well! Here are mine, in no particular order: courage, compassion, curiosity, happiness and humor. Thanks, Melissa. That’s sweet of you to say. I am so glad you brought up courage and curiosity. Courage is a HUGE quality I admire in others. I can’t believe it didn’t pop into my mind when I made my list. And curiosity is indispensable. Put those two things together and you’re bound to change the world. Great stuff. Sarcasm! I love it. It blends well with the other two qualities you like: humor and honesty. Thanks for sharing your Favorite Five! Ann, these are all the words I’d use to describe you! Great stuff. Thanks for sharing. Arindam, your list is lovely. Innocence is not something that would have come to mind immediately for me, but when I think about it, people who keep their innocence (as opposed to becoming jaded) seem to live life more fully and appreciate all it has to offer. Thanks for adding your voice to the conversation today. Optimism, loyalty, integrity, persistence, understanding. Seems like you and I think a lot alike, Tracey. Persistence is a great quality too. It’s definitely necessary as writers! Can you send a pinch my way today? They’re all kind of inter-related, now that I look at them . . .
You’re right, they are kind of inter-related. Compassion is a powerful word (and quality). It’s an idea that floats through our house all the time, especially in the midst of a variety of projects currently in the works (more on that later). Thanks for joining the conversation today! Becky, I don’t have a “five” list, but I feel like if I can hit any one of those five things on a given day, I’m doing okay! I had a hard time narrowing it down to five, but the five qualities I mentioned popped into my head first. People who are optimistic always inspire me because that quality colors every other aspect of one’s life. Thanks for dropping by today! Have a great weekend. Loved your latest blog post. Haven’t commented yet but I will!